When I was a kid, we had relatives that lived in the Middle East. Every time they came home it would be with bagfuls of chocolates and treats of the kind that were not available to us at home in India. Some of these tastes I have never forgotten. For example, I love Werther's butterscotch caramels, or the taste of tinned Kraft cheese (blush!). There was another candy that my uncle used to bring us. The name has been long lost among dusty memories (I think it may be Kopika, but I am really not sure), but the taste has not been forgotten. It tasted of coffee and chocolate. Just that. Coffee and chocolate, each easily identifiable, but melding together in a distinctive taste. I have never had cause to think of those chocolates for a long time, but for a concoction I came up with this evening. I was browsing Mangocheeks' Allotment to Kitchen blog, and she mentioned entering the 'We Should Cocoa' blog event, which is being hosted by The Chocolate Teapot. The theme for this month was 'Surplus Stock or Leftovers', and obviously one of the ingredients had to be chocolate or cocoa products. What a splendid idea, I thought. I had a cup of half and half, and another of whipping cream that I had left over from my last ice cream making endeavour (maple icecream with pecan praline, if interested) I also had a bar of milk chocolate that I had carefully hidden from both Kay and Aditi. Trust me, if you knew those two, you would hide any chocolate you had too along with anything else that may be remotely connected to sweets. Anyway, I thought, since I found the chcolate, why not enter the event? As most of you probably already know, I am a big fan of David Lebovitz and his book 'The Perfect Scoop'. I had a quick browse through his recipes, and settled on the chocolate ice cream, Philadelphia style (without the egg custard). But you know me. I can't resist tinkering, and so I thought, hey, why not add coffee to the chocolate, wonder what that would taste like? I mean, mocha tastes pretty good, and chocolate and coffee are already pretty good mates anyway. I have never tried my hand at making ice cream and never knew where to start...now I do! Thanks for the recipe Michelle..u made it sound sooo easy that I am going to give it a try! Excellent stuff. "...actually I had forgotten that I had hidden that chocolate bar" - and that is the ONLY way chocolate survives in my house... I bought a box of chocolates for over Christmas... lasted two days with a real struggle. @Shireen, thanks. Its really easy once you get the hang of it, and then you will never buy ice cream again!! @Chumbles, poor you. I do know what you mean though, Christmas is such an indulgent time that you really have to make up for it later. And chocolate never lasts in our house for more than a day. 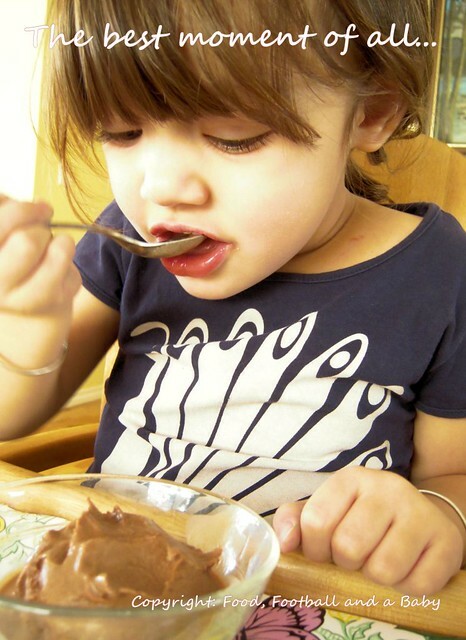 Funnily enough, Aditi loves dark chocolate, but its something I never developed a taste for. @May, yes, that's the one!!! It had a black wrapper and red writing on it. I have been googling like crazy, and the closest I have come up with is that it's called Kopeka. I wish I could remember that name. I used to have an aversion to chocolate and coffee flavoured things, but fortunately times have changed. The texture of your icecream looks fab too. PS Thank you so much for the kind mention too. It is really appreciated. 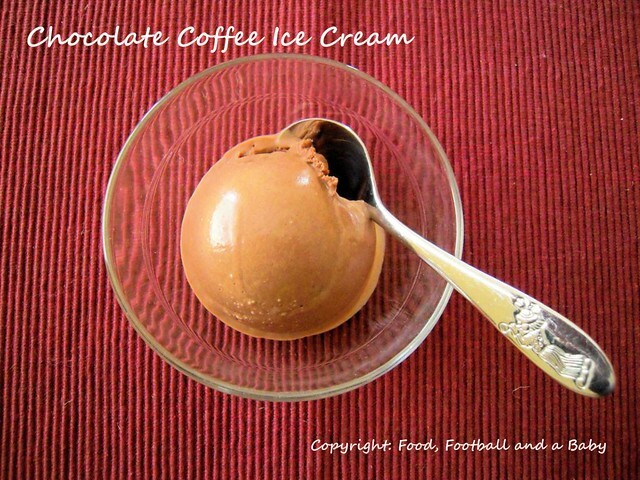 Homemade ice cream sounds fantastic and you just can't beat chocolate as a flavor. Yours looks rich and creamy. I hope you'll come and link this up at Sweets for a Saturday #2. Tinned cheese? Really? Love the ice cream though! This ice-cream looks really good. I'm a little shy of coffee flavoured things but I'm starting to think it does go well with chocolate - sort of brings out the chocolate flavour. 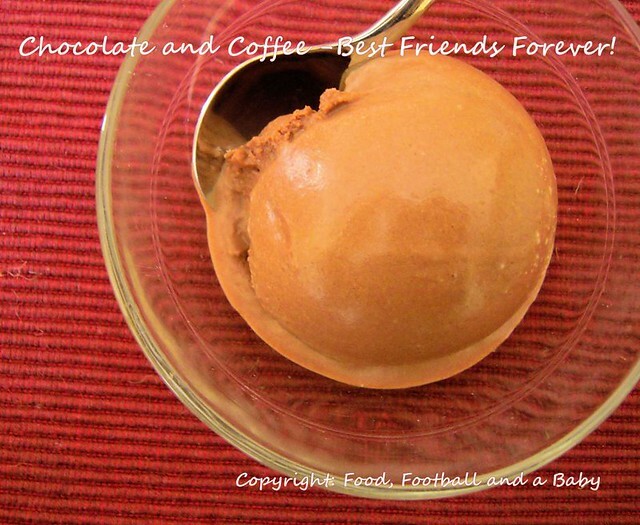 i used to make mocha ice cream as a little girl - but have long lost the recipe. i do remember stirring in egg whites and not needing an ice cream maker! this is definitely worth a go, looks yummy and my amazing ice cream maker is going to have to come out! @Mangocheeks, thanks. It was your blog that inspired me to get off my backside and do something constructive with mine! @Lisa, I linked mine up. Love the idea. @Lucy, yes, Kraft tinned cheese :-) Can't believe it now! Loving you nickname!! @Choclette, thanks. I have always loved coffee flavours, its strong, cut complements others perfectly. @Pearplumpie, you could probably make the icecream with no icecream maker too. I have recipes on here that I made before I got mine. But I think with this one its easier and the texture is better if its churned in a maker. Thanks so much for linking this up to Sweets for a Saturday. I hope you'll be able to join in again. I love the coffee and chocolate combination. Wish we were having ice-cream weather! !